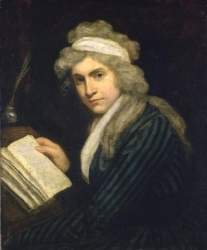 Mary Wollstonecraft was an English philosopher/writer and early feminist who denied male supremacy and advocated equal education and opportunities for women. As an independent, self-taught woman who, espousing the enlightenment ideal of reason, declared that women's rational natures are no less capable of intellectual achievement than are those of men. It may then fairly be inferred, that, till society be differently constituted, much cannot be expected from education. Of women I do not wish them to have power over men but over themselves.